Why Are Fatality and Injury Rates for Pipeline Workers Underreported? | Larson Law Firm P.C. Why Are Fatality and Injury Rates for Pipeline Workers Underreported? State-run OSHA program numbers are not included, of which there are 22, and six state-run OSHA plans which cover only state and local government workers. It’s estimated that incidents are underreported by about 50%, and self-reported incidents may lack crucial details or information. OSHA jurisdiction does not cover incidents that occur on public streets, highways or on a normal commute. Trucking/Hauling-related incidents may be listed on other NAICs codes. In an investigative report in Pacific Standard, Antonia Juhasz painstakingly pored through massive amounts of government data to uncover the truth about the toll on human lives it takes to build an oil and gas pipeline. Juhasz’s is the first independent investigation to compile worker fatality rates for the men and women who build this country’s oil and gas pipelines. Her findings were grim, and they bear close examination. In 2016, oil and gas pipeline workers died on the job 3.6 times more than the average American worker. (This was the highest fatality rate and highest number of workers killed since 2012). The Bureau of Labor Statistics (BLS) began reporting on oil and gas pipeline worker fatalities in 2003. Since then, the reporter’s findings reveal that the on-the-job fatality rate has averages 4.3 times greater than average for 2008 and 2009. Between 2003 and 2009 the number of deaths increased from 15 to 25, which is a 60% increase. Because the BLS publishes worker fatality rates for oil and gas extraction only occasionally, and does not include pipeline workers, Juhasz analyzed the data and calculated the rates herself. She found that in 2014, oil and gas pipeline workers had a workplace fatality rate that was seven times greater than that of the average worker. The Pacific Standard article quotes industry estimates that suggest about 500 construction workers are needed to build 100 miles of pipeline. One company estimated that they were going to need about 10,000 temporary workers to build the Dakota Access Pipeline (DAPL). The reporter tried to get a tally of workers killed during the construction of the DAPL, but none of the companies involved provided a list. After a worker dies, OSHA comes in and conducts an inspection which can result in fines if safety violations are found to have contributed to the worker’s death. 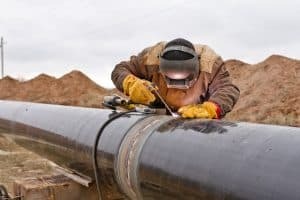 However, OSHA has categorized building oil and gas pipelines and other oil and gas industry jobs as “low-hazard industries,” and if a company has ten or fewer employees, they are exempt from OSHA inspection until a serious injury or fatality occurs. These small companies are also exempt from keeping records of employee injuries or illnesses unless three or more employees are hospitalized at once, according to the Pacific Standard article. It’s unbelievable how an industry with such a high worker injury and fatality rate can be considered a low-hazard industry. Furthermore, there is currently a hiring freeze at OSHA; the agency has lost 6 percent of its permanent workers and its budget is lower than it was in 2010. Because the new focus is on rolling back regulations, there aren’t as many people looking into deaths and injuries. The pipeline injury lawyers at Larson Law Firm, P.C. are here to represent your interests. Whether you have sustained a serious injury on the job, or if you have lost a loved one, you may be entitled to compensation for medical bills, lost wages, and disability. We fight for your right to get the justice you deserve. You may schedule your free initial consultation with an attorney by calling our Minot office at 701-484-HURT, or filling out our contact form today.